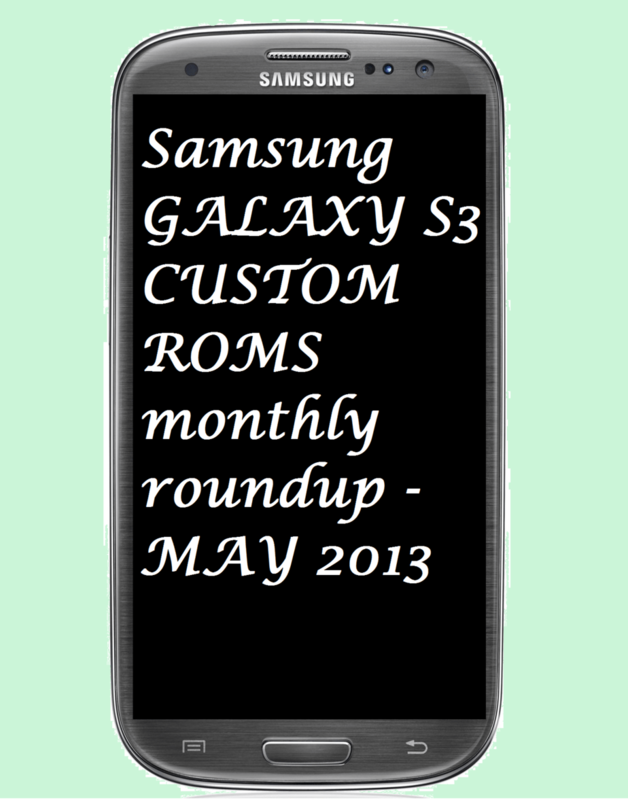 Welcome to our monthly roundup of Custom ROMs for the Galaxy S3, a new section on our website, where we decided to put together all the major Custom ROMs that were released in the last month for this device. We are going to describe to features of each ROM as well as provide you with the download link and installation instructions. There will be no specific order for the ROMs, as it is very difficult to establish which is the best one and in what order. This is basically all about personal opinions and personal preferences. What one person may find useful, another may find useful. 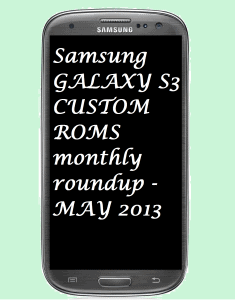 If you are still unfamiliar with the term ‘Custom ROM’ then you should pay a visit here. Also you may find the option ‘Aroma installer’ in many ROMS, so here’s something to help you with that if it’s new to your ears. These article is only about Galaxy S3 I9300, so if you own a different version of the phone, do not install any of these ROMs. Again, these are just for the I9300 version. Number 1: SuperNexus 2.0 Build 4 (03.04.2013). The SuperNexus series has always been about providing the Vanilla Android experience on Galaxy S3, which is the same as the Google’s Nexus stock ROM. Having zero bloatware, the ROM is super lite and fast. Also it runs on Android 4.2.2 having all the latest features and apps as in the stock AOSP ROM. After installing this you will feel like owning a Nexus 4 rather than a Galaxy S3 and thanks to all the optimization and tweaks the device will run incredibly smooth and fast. Here is the original thread for the full information about this ROM. Number 2: AvatarROM 2.9b. Enjoy a ROM based on CyanogenMod 10.1 and Android 4.2.2, with amazing themeing options from MIUI. You can change the theme using the built in app. You will also get bazooka launcher, a custom launcher developed by the same team with many customization included. The messaging app, boot animation and font theming are also customized. Head over to the original thread for the complete info. Number 3: Temasek’s UNOFFICIAL CM 10.1 RC1. This is an unofficial release of the well known CyanogenMod ROM, that recently released the first Release Candidate version based on Android 4.2.2. This is meant to be used as a daily ROM by anyone. This is not officially released by the CM team but has the same features and probably some additional tweaks. Read here the entire description and features of the ROM. Number 4: Omega v7.0 AOKP. The Omega team has also compiled a ROM from the AOKP JB milestone 1 source, combined with some of CyanogenMod’s features. Running Android 4.2.2 and apps such as Playstore and Gmail updated to the latest versions, the ROM also adds flash player support, Addfree android, 3 launchers, instant GPS lock and other tweaks and improvements that you can check for detailed info here. Number 5: Omega v43.4 (19.04.2013). The Omega name is very popular among developers. This version of the ROM runs on Android 4.2.1, based on the beta firmware XXUFMB3 leaked a few months ago. The firmware has a lot of customization in it. Besides being rooted and deodexed, you get all Google Apps from Android 4.2 plus the Omega additions. This includes flash player support, multiwindow manager, removed bloatware, call recorder, faster GPS lock and dozens of other mods and additions. For the complete list of features and installation guide, visit the original thread here. Number 6: Liquid Smooth v2.3. A new ROM based on AOSP running Android 4.2.2, having a lot of visual improvements and performance tweaks. The added functions such as in-call recorder, Statusbar Auto-Hide, MediaScanner Behavior On Boot, Custom Shortcut Quicksettings TileBlacklist Unknown Number Functionality, Option To Mark User Rejected Calls and so on are what make the ROM much useful than the Stock ROM. Read here more about it. Number 7: Slim Bean Build 5. Another original ROM from a great team of developers, Slim Bean combines the lightness of Android 4.2.2 AOSP with the custom features and optimizations that make the ROM so cool. It includes features such as “hands free” that allows you to take photos using the proximity sensor, Nova launcher, smart capture, blacklist unknown numbers and many performance optimizations. A very good, stable and lite ROM that can be used daily. See here how to install it on your Galaxy S3. Number 1: Sotmax JB Ultimate Stock V19 HD Voice. The slogan for this ROM is “stable as rock”, so this should give you a preview of what to expect. Otherwise, Sotmax keeps the stock ROM unchanged visually, while providing root access and performance optimizations. It runs on Android 4.1.2 XXEMC3 and contains mods such as SNote from Arsaw, 4.2 camera from Nexus 4, improved Ram and speed performances, some changed UI sounds, weather in lockscreen, transparent multiwindow, paper artist app, and some features from the S4 such as boot sounds, touch sounds and music player. See for yourself here and learn more about the ROM. Number 2: Android Revolution HD 26.0 (8.05.2013). Also already a well known name, it runs on Android 4.1.2 XXEDM2. Regarding the features, Android Revolution brings no changes in the visual aspect of the device, however you can enjoy a lot of improvements in stability and performance. The ROM runs really smooth and fast. Thanks to the optimizations and removed software, your Galaxy S3 will run faster than ever. Go here and learn more about the Android Revolution HD ROM and how to install it on your device. Number 3: WanamLite MD2 V6.6. This ROM developed by Xda member ‘wanam’ runs on Android 4.1.2 XXEMD2 and contains the latest tweaks and optimization available. If you decide to install this ROM, you will enjoy the latest Jelly Bean features, the latest SuperSU and CWM Recovery, more free RAM, unlimited SMS recipient list, call recording enabled and many other add-ons that will make your phone run like crazy. Besides amazing speed you also get to enjoy many additional features that the stock ROM can’t provide. Here’s the original thread for complete feature list and installation files. Number 4: crDroid v17.2. It runs on Android 4.1.2 XXEMC3 with the latest root Super SU installed. It also contains the latest Google Play app, Multi Window Control, AOSP lockscreen, a call button in the call logs and many more other added features that the original ROM doesn’t have. This ROM is available with AROMA installer and gives you the option to choose whether you want all system apps installed or not or if you want to choose only some, plus other installation options. The full feature list and install instruction can be found here. Number 5: NeatROM Lite v4.1. The latest version runs on Android 4.1.2 XXEMC3, and is fully rooted, deodexed and zipaligned. The tweaks and optimization that the ROM has include improved virtual memory, reduced home button lag, media scanner fix, custom boot-animation, removed bloatware and many more. All these only make the S3 run a lot faster and preserve battery life also. Check it out here if you are interested in installing it. Number 6: AllianceROM EMB5. Running Android 4.1.2 XXEMB5 you get plenty of customization from this ROM. It’s creator has included 10 lockscreen modes, 5 battery options, show/hide option for various functions of the system, redesigned Gallery, VideoPlayer, MusicPlayer, Clock and Calculator apks, plus tens of other interesting options and features that are meant to make your experience easier and faster on the Galaxy S3. If you visit this page you will learn everything there is to know about the ROM. Number 7: XperianZe 0.99. This Galaxy S3 ROM will run on Android 4.1.2 XXEMC3, but be sure that it will have a lot from the Sony Xperia Z in it such as the launcher, keyboard, lockscreen, fonts and more. The ROM is very clean, with bloatware removed weighting only 416 MB. Some of the mods include Lite Camera MOD for better filming quality, Bravia engine v.2, Media Scanner fix, Call recorder, the latest Play Store installed, MultiWindow Control, and of course a lot more that you can learn about from the original thread. This is our collection of Custom ROMs selected for the Galaxy S3, but as I said, it’s all about personal preferences, so if you have any recommendations for us, please feel free to share and contribute.